Lion and Lamb birthday party theme - great for twin or sibling birthday parties. Decorate paper or foam crowns with stick on jewels. Make a cute picture of a lamb using the handprints of the party guests. You will need heavy construction paper, cotton balls and black or pink paint. Pour paint into a container that is fairly large (at least 8" wide) and shallow. The paint should only be 1/4" or less. Let the guests place their hand in the paint one at a time and then stamp their hand onto a piece of construction paper. Show them that the fingers of their handprint will be the lamb's legs and the thumb will be the lamb's head and neck. Let them glue cotton balls to the palm of the print to make the body. Draw eyes and ears with markers. Create Lion and Lamb masks with paper plates. Lion mask: Before the party punch holes around the outside of a paper plate about 1" apart and 1/2" from the outside of the plate. Cut holes for the eyes. Lay out different colors of yarn in "lion" colors - orange and brown - that are cut into 4" pieces. Show the guests how to fold a yarn piece in half, put the looped end through the hole of the paper plate, then take the two ends and put it through the loop. Pull gently to tighten the yarn around the paper plate. Continue all around the plate to make the lion's mane. Let the guests decorate their mask with paint or markers. OR: instead of yarn let guest staple long rectangular pieces of brown construction paper around the outside of the mask. OR: Cut the end of orange and yellow post-it notes into shaggy strips and then stick them to the back of the paper plate for a mane. Lamb mask: For the lamb mask first cut holes where the eyes will be. Set out cotton balls and let party guest glue the cotton balls round the paper plate for wool. Then let them color or paint. This is a fun tag game for when you are outside or have plenty of space to run. Guests will line up and hold hands. They can not let go of each other's hands for any reason. The first person in line tries to tag the last person in line. When the first person has tagged the "lion's tail" then the "tail" comes to the front of the line and becomes the "tagger". Continue until everyone has had a chance to catch the lion's tail. tails they have to stick on the Lamb. Teams (or individuals) try and blow cotton balls across the floor to the finish line. Before the party decide if the guests will be playing the game as teams or will let the guests compete individually. For teams mark 2 sets of 6 - 7 cotton balls in separate colors using markers. For individuals mark 2 - 4 cotton balls in different colors (one color per guest). The idea is to herd the lambs (cotton balls) across the floor to the finish line by blowing on them. They can not use their hands or touch the cotton balls in any way. The finish line can be a straight line across the floor from the start line or "pens" can be set up using electrical or masking tape and making a 10" circle on the floor that all the cotton balls have to be put into. For older children and more of a challenge use ping pong balls (decorate them like sheep with a marker) and use the "pens" as the finish line. Children search for hidden Lion and Lambs and turn them in for prizes after the hunt. Before the party buy lots of large Pompoms in white (lambs) and orange (lions). Hide the pompoms around the backyard, party area or park before the party guests arrive. 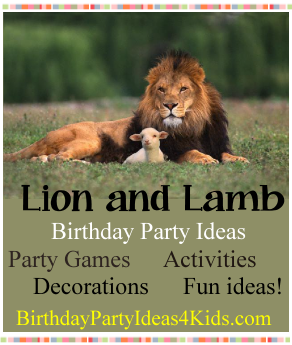 Tell the guests to search for the lost lion and lambs. When all the lions and lambs have been found let the children trade in the Pompom's for candy or small toys. For Lion cupcakes use any of these items to make a lion mane around the edge of the frosted cupcake - shredded coconut, orange gumdrops, jelly beans, cornflakes or colored frosting. Use marshmallows or coconut to decorate the lamb cupcakes.